The chef and entrepreneur won't settle for anything less than perfection -- which is why she spent two years developing a single cake recipe. No one has ever called Christina Tosi a culinary snob. After all, the chef and founder of Milk Bar has created a sweet-treat kingdom built on American nostalgia. 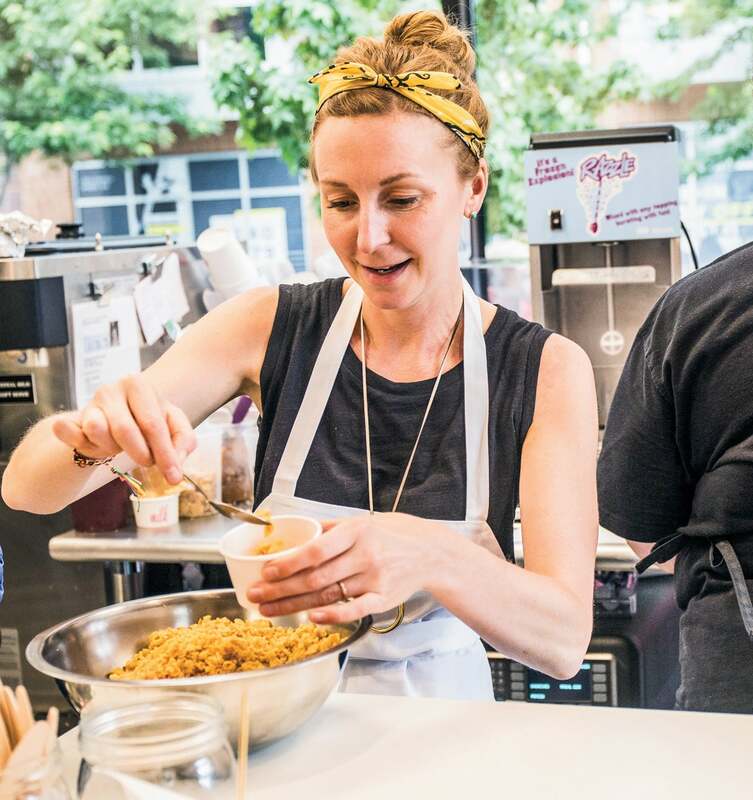 Her aversion to elitism inspired her comforting but inventive cookies, cakes and soft-serve (Cereal Milk ice cream is a winning example), all of which are a national fascination. It’s led to 14 stores, partnerships with Target and JetBlue and celebrity status for Tosi, who has served as a judge on MasterChef and penned two cookbooks. (Her third, All About Cake, is out in October.) Now, after a decade in business and a recent fundraise, she wants to expand to grocery stores, customers’ doorsteps and more. We talked with Tosi about creating your own comfort in business, taking care of the people around you and why the perfect dessert can take years to get right. Your company is built on nostalgic flavors from many Americans’ childhoods, but it also feels unique and modern. How did you find that niche? I spent 10 years in other people’s kitchens, making their recipes. That’s the reality of when you’re first starting out. When it came time for me to consider my own voice in food -- when I was no longer learning technique -- I’d ask anyone and everyone, “What’s your favorite dessert?” Even in these communities of cooks with decades of experience and education and access to the most insane kitchens, they’d say, “My grandma’s chocolate chip cookie,” or “McDonald’s fried apple pie.” It helped me understand what people really want. But I would never dare try to compete with, say, my grandma’s oatmeal cookie -- she made the best. I realized that my place in the world wasn’t to compete with these memories but to breathe new life into them. Now you’re 10 years in, and everyone wants a piece of the pie, so to speak. How do you decide which opportunities to pursue, keeping that spirit in mind? We never do anything for the “wow” factor. We do something because we connect with it emotionally. We can spend two years developing a single product. If something doesn’t bring that warmth, that comfort, that feeling of a big hug from Grandma, we don’t do it. Our partnership with JetBlue last year is a great example. Flying was always one of my favorite things to do as a kid -- we didn’t do it a lot, usually just to Ohio from Virginia -- but I remember staring out that window with wonder, scrunched up in my seat. An airplane remains one of my favorite places to daydream. So a Milk Bar cookie definitely has a place there. Wait; which product took two years to develop? The birthday cake. That little stinker took two years! My mom was a working mom, so for my birthday growing up, she’d run to the grocery store and buy a box of cake mix and a tub of frosting. In 30 minutes, there was a cake on the table. We wanted to make that from scratch as classically trained pastry chefs. And it took us two years to capture that emotional memory and get those flavors just right. We could have put it on the menu, I’m sure, six months or a year into the process and it would have been fine. But it wouldn’t be what it is today. That’s what being a great chef and a great businessperson is all about: not stopping just because time’s up, but knowing when you’ve actually hit the mark, and being relentless until you get there. You have 14 stores, product at Target and cookbooks, and you’ve collaborated with everyone from the retailer Madewell to fast-casual restaurant &pizza. Whom do you look to for guidance at this stage of the business? My personal mentors are my grandmas -- neither is still with me, but I use them as my moral compass. But my greatest mentor over the past few years has been my husband, Will Guidara. He knows me well enough to say, “Your grandma wouldn’t be cool with that,” and he’s a restaurateur himself, so he helps me figure out how to bring the truest form of me to the table. I think a lot of people underestimate how many answers they have in themselves; oftentimes mentors are the ones who just help you find the key to unlock it. People who are the closest to you are your best mentors. It doesn’t have to be someone who has 20 years on you, and it doesn’t have to be someone in the same business as you, someone who has all the networks, secrets and connections. But it has to be someone you can be outrageously honest with. Is there a specific hurdle you recently worked through together? When I was starting out in this industry, I didn’t see a lot of women in the kitchen. But I found my place among men as the woman who loved to pal around and be like everyone’s kid sister. When I raised capital for the first time late last year, I had to work through a lot of contracts and sit at a lot of tables and negotiate with a lot of people. I was immediately put back into this place of I’m the only girl in the kitchen again. But my husband helped me allow that emotion to exist while also finding a path forward. I never let myself get emotional in the kitchen at my first job or second job or even third job; instead, I found ways to help people around me feel like they knew me and like they understood my goals. That turned them into teammates rather than enemies. And that’s still a good strategy. How have your own support systems impacted how you guide your team? I’m a big proponent of making myself as accessible as possible to my team -- and to the people in our industry who are looking for mentors or a helping hand. Or an oven when someone’s oven breaks. Or a delivery van when there’s a fender bender. It’s doing the basic neighborly things I was raised to do as a kid. Most bakery COOs would never say, “Let’s go get lunch” or randomly drop off doughnuts to one of their stores or make a playlist. I guess I do the things that are simple and honest and often cost nothing at all, except for effort and the desire to connect. And I take the time to do that. That must be harder to do as you continue to scale. We employ 250 people, probably 300 by the end of the year. We defy on every level what working at a bakery can and should be, from how we pay our employees to the benefits we offer -- we have a 401(k) plan and maternity and paternity leave, which are just not real things you find at most bakeries. As a kid, I was like, I want my own bakery. But it was a pretty selfish vision -- I never thought about the kind of impact that might make on people’s lives. It’s been incredible to create this community of empowerment and connectivity. You mentioned your recent Series A funding -- what are your plans for that capital? To grow, but in places where you might not expect us. It’s not to open 101 Milk Bars. It’s to increase our ability to, like, show up on your doorstep. It’s to meet you in the aisles of your grocery store. It’s to meet you at those moments in life that you could very easily take for granted. It’s to remind you that there’s cause for celebrating the everyday. Is it getting tougher to juggle the roles of chef and leader? I’m never missing the kitchen when I’m in the boardroom, and I’m never missing the boardroom when I’m in the kitchen. But I often find myself saying, How can I bring more of the kitchen into the boardroom, and How can I bring more of the boardroom into the kitchen? I try to bring that craftsmanship, that sensibility of looking at ingredients differently, to how I assess business challenges and strategies and positions. All your guiding philosophies and themes intertwine. They all have layers of meaning. If you’ve ever seen one of our cookbooks, you’ll see that in order to make, say, the cornflake chocolate chip marshmallow cookie, you’ve gotta make, like, three recipes just to get to the cookie. Because there are layers to everything we do.